This year turned out much better than expected for Terraforce. 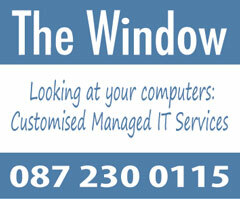 If you build a company on a strong foundation and accomplished partnerships, any economic crisis can be overcome. And so we would like to end the year with a small selection of some of the remarkable projects completed this year. 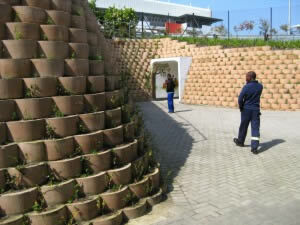 The retaining walls provide functional walkways and terraces for staff traffic and relaxation, permeable and plantable erosion control measures, as well as enabling Cape Scapes landscaping to soften the overall industrial feel of the facility with fast growing and water wise-plants. Closed face block system prevents sand from leeching through blocks. 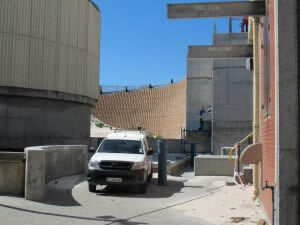 The City of Cape Town initiated a project to rehabilitate three anaerobic digesters by constructing a regional sludge handling facility at the Cape Flats Wastewater Treatment Works. Aurecon Consulting Engineers approached Terraforce for assistance in designing retaining walls of up to 8m high to support earth fill and cut slopes of a new road leading up the sludge holding tanks installed at the upgraded site. 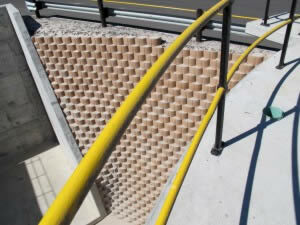 A segmental block retaining wall system was considered most suitable for this project, as insitu material consists of fine sand and the client needed a closed face block system that prevents sand from leeching through the blocks. In total 5200 blocks were used. 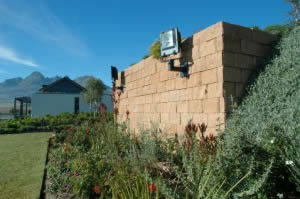 Hannes Bouwer of Bouwer Architects specified segmental block retaining walls as a stable, low maintenance and long term solution to prevent soil erosion: “The rock face blocks blend with the natural environment, their sandstone colour matching the surrounding soil. 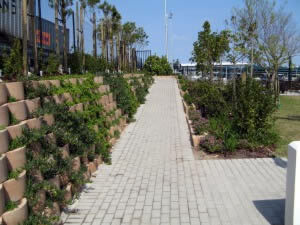 They are plantable and permeable, allowing the landscapers free reign.” The result is a balance of large trees, mainly indigenous shrubs, perennials and groundcovers that swathe and run alongside the retaining walls, roads and paddocks. 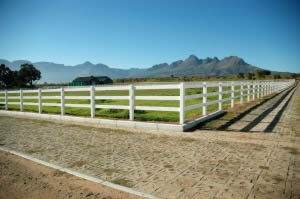 Between the paddocks, permeable hardlawn pavers were installed to handle storm water runoff and add a park-like or pastoral feel to areas normally needing hard paving or tar.